As far as station set-ups and expertise are concerned, we are looking at two main areas of communication; firstly that of Local-to-Medium Distance (involving UK, Republic of Ireland, Near Continent and Scandinavia); secondly,that of International/Worldwide communications. Also required is expertise in interfacing these two and additionally integrating such message-passing into the general RAYNET VHF/UHF system. Experience in use of various modes (particularly Datamodes) would be advantageous. This diagram should show the ideal relationship between the modes, methods of working and the routes for traffic. Obviously we do not expect each participant to possess all these facilities! Please just let us know your area(s) of interest/expertise. At the moment, we are especially looking at structuring the International/Worldwide Communications facility, so if you have a well-appointed long-distance HF set-up and have experience in working DX, DXpeditions or regular long-distance skeds, then why not put your skills to use in this area of Amateur Radio Emergency Communications? 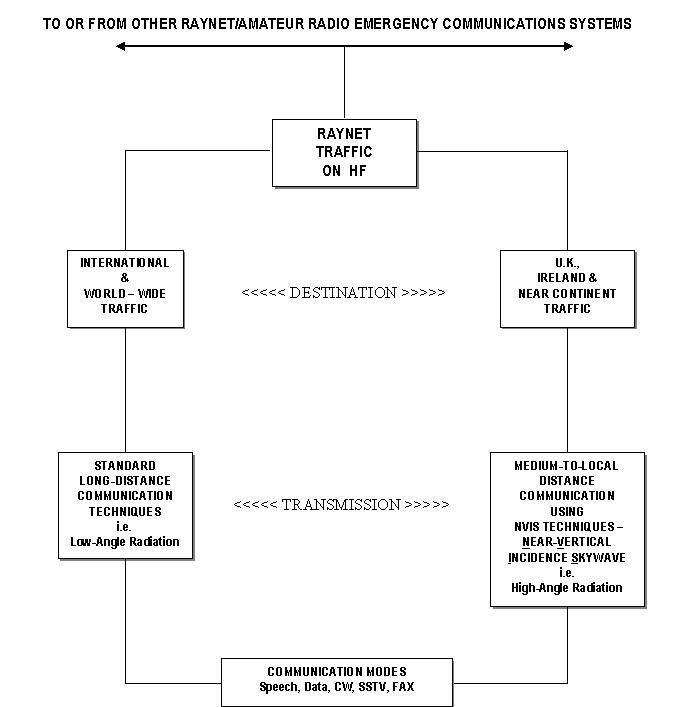 If you think about it, working a long-distance station and exchanging reports (as you would do in a contest or pile-up) is only the BEGINNING in Emergency Communications; the skill is then exchanging important messages accurately to ensure they arrive at the correct recipient and subsequent action taken on these which affects people’s health and welfare in an incident. Now that’s really using communication – the ULTIMATE CHALLENGE – not to mention the personal satisfaction of having done a worthwhile task.